Some of the localities are once again reported to be under attack from gastroenteritis with a five-year-old girl, Afsana of Tilak Nagar who was admitted to the Civil Hospital here, having died yesterday. Three other children from the same family have also been affected by the disease. 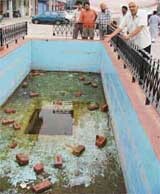 Resolving to erect a memorial of Shaheed-e-Azam Udham Singh, trustees of the Ludhiana-based Udham Singh Memorial Trust today decided to take their years’ old battle to a logical conclusion on the 65th martyrdom day of Udham Singh here. 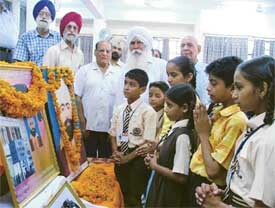 Children and trustees of the Udham Singh Memorial Trust pay tributes to Udham Singh on his martyrdom day in Ludhiana on Sunday. — Photo by I.V. The district administration has reportedly recommended two railway barriers instead of one to avoid confrontation between two groups of residents, seeking barriers at different places on Dhuri line. The Honda incident would not have occurred if Honda Motors and Scooters India had a registered trade union to ensure smooth communication between workers and the management, said CPM leader Sita Ram Yechury while addressing a district rally of CITU here today. A woman postal employee, who duped about 18 saving account holders of Rs 10.62 lakh ultimately fell in the police trap. Miss Jyoti Bala, 27, a resident of Moga and employed in the Head Post Office, Jagraon, used to enter the amount in passbooks of account holder but did not show the entries in the computer for the past about one year. ‘Naming’ game: After the unceremonious exit of the district president of the Youth Congress, it seems to be the turn of the president of the District Congress Committee to be replaced which was imminent after the new PPCC chief took over. Functionaries of the Congress here say that more often than not, the names doing the rounds for any post are the last to be considered. The Khanna district police chief has termed the reports regarding suicide by a detainee in the police custody as misleading as the deceased had come to the Malaudh chowki willingly. “The women can claim Rs 3,000 if they are contesting a case in the high court and Rs 2,000 for a legal battle in lower courts under the Dowry (Prohibition) Act, but very few women know about it,” said Mr R.L. Kalsia, Principal Secretary, Social Security, Woman and Child Development. Driving under the influence of liquor and using mobile phone while on wheel were the two main reasons for road accidents during recent years, according to a study conducted by the District Sangrur Traffic Control Society headed by Mr Harinder Singh Chahal, Senior Superintendent of Police. Suvidha, a facility created by the district administration to help people in meeting their day-to-day needs, has proved successful. Under this facility, preparation of affidavits, driving licences, passports, renewal of arms licences and getting copies of different official documents has become easy. The Lal Bahadur Shashtri Social Forum has demanded a compensation of Rs 10 lakh each for the victims of yesterday’s train-car collision at an unmanned level crossing near Himmat Singh Nagar, while announcing it would call on Railway Minister Laloo Prasad Yadav to install barriers at all such level crossings. Activists of the Civil Lines Young Society today staged a dharna in the Kitchlu Nagar market against non-functional fountains and poor maintenance of parks in the area. They said if the complaints weren’t looked into, they would gherao the Mayor. Led by Mr Sandeep Kapoor, Chairman of the society, the residents claimed that they had submitted complaints to the area councillor a number of times but nothing had happened. Samosa, a popular snack of northern India, is available at innumerable places throughout the city. From hotels to roadside shops, this fried snack can be had with a variety of chutneys and masala chana. 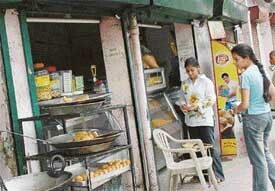 A college girl at Kalia Sweet Shop outside Government College for Boys in Ludhiana. Maa Bhagwati Club arranged the marriages of three poor girls at Shri Guru Singh Gurdwara here today. The president of the Club, Mr Ashwani Sikka, and other members of the club were present to give their blessings to the couples. 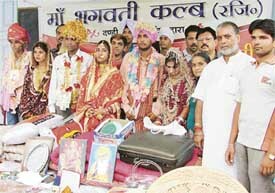 Three poor girls get married in Sri Guru Singh Gurdwara in Deep Nagar, Ludhiana, on Sunday. — Photo by I.V. The Desh Bhagat Group of Institutes, in collaboration with the Punjab Commerce and Management Association (PCMA) organised the 4th National Seminar on “Mergers and acquisitions in India” today at Desh Bhagat Institute of Management and Computer Sciences. Students of M Sc (IT) II of Khalsa College for Women have bagged the first, fourth and ninth positions in the Panjab University examinations held in April 2005. Shveta Jain of MSc (IT) II year is the university topper by securing 89.06 per cent marks. Government school teachers have shown tremendous interest in preparing innovative teaching aids related to the latest concepts in education during the ongoing teachers’ training programmes held at the 13 blocks of the district,” said Mrs Usha Sidhu, Principal Government Inservice Training Centre (GITC), here yesterday. The death of one person undergoing treatment for a water-borne disease in Rani Mill Complex here has created a panic among the town residents. In Rani Mill Complex here social worker Narinder Singh Babby(45), after 25 day of treatment died at Rajindera Hospital, Patiala on Friday. More than 150 patients were examined, out of which 54 were provided spectacles and 32 others were selected for surgical correction free of cost an eye check-up camp, organised at Shaheed Kartar Singh Sarabha (Charitable) Hospital at Sarabha village in this district today. Pall of gloom descended in the village as the news about the death of Amarjit Singh Ambi, a kabbadi star of this village, during a tournament being held in Canada, broke today. He died immediately after playing a match for the Calgary Sports Club, Canada. Jasdeep Sehgal took six wickets for 20, including a hat-trick, as Kundan Vidya Mandir Senior Secondary School, Civil Lines, beat Government High School, Birmi, by seven runs in the semi-final match of the Ludhiana Zonal (PAU) Cricket Tournament (u-16) played at the Government Model Senior Secondary School, Punjab Agricultural University, here today. Rajesh Gandhi remained unbeaten on 41 runs and helped Municipal Corporation Club to defeat Sports Centre Club by two wickets in a cricket match played at Satish Chander Dhawan Government College for Boys ground here today.